CALYX wins the Coventry Stakes! Newmarket trainer John Gosden registered his 44th winner at the Royal Meeting after Calyx justified the hype and 2/1 favouritism to provide his sire Kingman, also trained by Gosden, with a first Group success in the G2 Coventry Stakes. Ridden by Frankie Dettori, recording his 57th triumph at Royal Ascot, the two-year-old took up the lead in isolation towards the stands' side rail and kept on well in the closing stages of the six-furlong contest to score by a length from the fast-finishing Advertise (10/1), trained by Martyn Meade, in second. Gosden was effusive in his praise of Calyx following the race, describing the colt as "a horse that makes you get up in the morning." Calyx made his debut just 10 days ago when making a winning debut at Newmarket by five lengths under Robert Havlin. 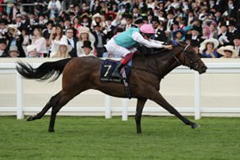 Gosden said: "Calyx is very talented. His father was exceptionally talented and Calyx has all of those attributes. I think the high draw might not be the best draw. In the Queen Anne, low numbers were first, second and third. The high draw was a disadvantage and I couldn't believe that Calyx hung on like he did. It was a tough ordeal for him to race on his own on just his second start. If he had horses to race with him, I think that would have been better. It was a big achievement for him to win having raced on his own and he is worth more than the winning margin of a length to say the least. "We've won this race before but he does make you get up in the morning. Calyx has had to race on his own for the last two furlongs with a huge crowd screaming. That is a big ordeal for him and I think he did amazingly to win. I could have easily seen him getting distracted with nothing to race with. "Frankie said 'I have to go now, there is nothing carrying me into the race, I have got to go.' In that respect, it was marvellous and he is probably value for more than the winning distance. Calyx is a bit of show-off. I had to give him a bit of time. His father never ran until July whereas this boy has been out in June." Asked if Calyx is a 2000 Guineas horse, Gosden added: "I don't see why not. He is rateable and was relaxed enough early, but at the moment let's see if we can win a Prix Morny with him and then we will think about stepping up a bit later on. We'll freshen him up and go for the Prix Morny. He has done a lot of racing in 10 days. "He has got a good bit of scope and is a lovely horse to be around. He is a bit full of himself, but I was just very impressed that he could take the running up because nothing was left on his side. "I don't put Frankie on two-year-olds first time out ahead of Royal Ascot as I did it to him last year at Yarmouth and he injured his shoulder and missed this meeting. He's ridden him at home but just not on his debut!" The six-furlong Coventry Stakes is the early season highlight for two-year-olds over six furlongs. First run in 1890, it is named after the ninth Earl of Coventry, who was Master of the Buckhounds between 1886 and 1892 and again between 1895 and 1901. The Coventry Stakes regained Group Two (G2) status in 2004, having been a G3 since 1984. It is the first Group race for two-year-olds in Britain each year..